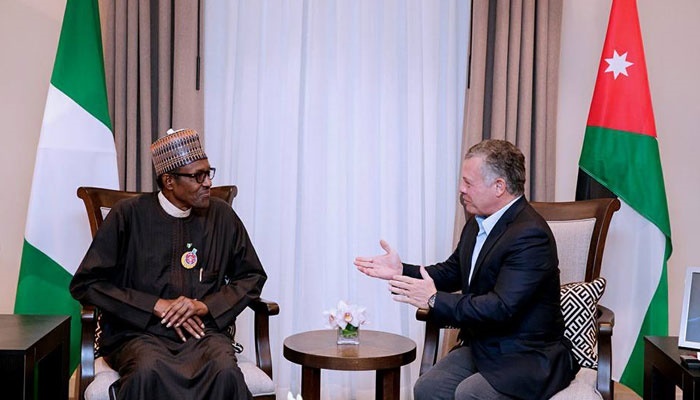 President Muhammadu Buhari and King Abdullah II of Jordan. President Buhari is in Aqaba, Jordan for a summit on counter-terrorism with other Heads of State. President Muhammadu Buhari has highlighted a few things needed to end the activities of terrorists world-wide. He says regional cooperation is now needed more than ever to combat the world-wide threat of violent extremism. Speaking at a bilateral meeting with King Abdullah II of Jordan, President Buhari stressed that inter-regional cooperation and information sharing were the only ways the evil of terrorism could be curtailed. At the meeting President Buhari thank the Jordanian King for his constant support and assistance to Nigeria especially with the recent donation of armoured vehicles and other military equipment to further bolster the war against terrorism and insurgency in Nigeria. A statement by a spokesman for President Buhari, Mr Femi Adesina said King Abdullah II advocated broader measures especially the use of cybersecurity in checking the influence of terrorists. He pledged the continued support of the Kingdom of Jordan to Nigeria in its war against violent extremism. For over eight years, Nigeria has continued to battle Boko Haram terrorists in the northeast region. They are pushing for an Islamic State and an end to Western education in the region. President Buhari's statement is coming on a day that two suicide bombers attacked a market in Borno State, killing at least 13 others.